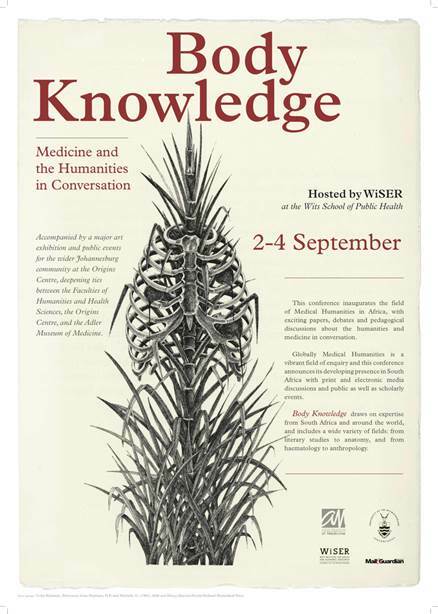 Between 2-4 September WiSER will host Body Knowledge: Medicine and the Humanities in Conversation at the School of Public Health at Wits. This conference inaugurates the field of Medical Humanities in Africa. Over three days, scholars from all over the world and working in a wide variety of disciplines, from anthropology to nursing, and from drama to haematology, will engage in intensive discussion over collaborations, tensions, and conversations between the humanities and medical sciences. In addition to panel sessions, there will be plenary lectures by Professor Julie Livingstone (Rutgers) and Professor Jane Taylor (Leeds) as well as several roundtable discussions. For more information about the conference, please see the website (http://wiser.wits.ac.za/page/body-knowledge-10975) or contact Dr Sarah Emily Duff (sarah.duff@wits.ac.za) or Dr Ashlee Neser (ashlee.neser@wits.ac.za).